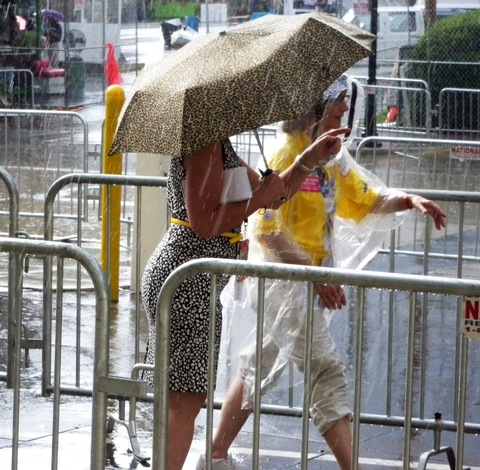 Umbrellas were a common sight as rain marked the beginning of the Democratic National Convention. Photo by Tom Kennedy / PBS NewsHour. With overcast skies and rainy weather this week in Charlotte, N.C., organizers for the Democratic National Convention are keeping a close eye on the weather forecast for Thursday, when President Obama is scheduled to deliver his party’s acceptance speech in an open-air football stadium. While the AP reports that officials will continue as planned rain or shine at the Bank of America Stadium, Charlotte television news station WSOC notes “Thunderstorms will not back down!” on Wednesday’s forecast. The National Weather Service predicts a 40 percent chance of thunderstorms Thursday with the likelihood dropping to 30 percent after 9 p.m. The President is likely to speak after 10 p.m.
“Of course, safety is our top priority, and if we have to activate a contingency plan due to severe weather, we will make a determination with enough time for arrangements to be made,” said Joanne Peters, the Democratic National Convention Committee spokeswoman, of possibly moving the location from the Bank of America stadium. A possible location would be the Time Warner Cable Arena, which will host most of the DNC events and holds about 22,000 (the Bank of America stadium seats more than 73,000).